It's good, ya'll. Truly, as described, Downton Abbey meets Darkest Hour. Here's my review on my blog, and the start of a giveaway you don't want to miss. Wickwythe Hall, you lovely, lovely page turner of a book. You kept me up reading past my bedtime. You are about one of my favorite genres. You made me imagine it all. You have delightful characters, and you kept me guessing until the end how it could possibly, possibly all end up right. I suppose, that said, you can tell how much I adored this book. Yes, the genre, World War II, upstairs / downstairs, Americans, Brits, and the French, that's my brain candy, but also it was top notch writing with a hook. And, I kept imagining hearing it in audio, or even seeing it playing out on the screen. Now as to the characters. The book opens with Annelle, young and French, and in great turmoil, as the unimaginable happens, and France is invaded. She somehow makes her escape, and is swept up with the crowd fleeing to Dunkirk. Next, helping the escapees from across the Channel, is Mabry Springs, an American wife of an Englishman with a manor. Though not fleeing from an invading army, her life is also in deep turmoil. Her story is sad, replete with the despair of multiple miscarriages, but definitely not an end. I was immediately rooting for her. Then, there is Reid Carr, another American in England but this time on behalf of Roosevelt, and giving us a glimpse into the personal leadership style of Winston Churchill. (I kept wanting to stop reading so that I could google Churchill and see if he really did do business in his bedchamber, but I was too hooked to let go of the page, so I'll have to look it all up later.) Back to Carr, he was immediately a hero waiting to happen with a pretty heavy load himself. Very easy on the book eyes. But wait, there's more. Because, as it turns out, Mabry and Reid know each other. Quite well. From a long time ago. And Mabry, having taken Annelle in, must now ask Reid to help Annelle locate her missing brothers, in France. See what I mean? Take the chance on this book. Put it in your lists and enter the giveaways (I'm ready for another of my readers to win one!). It's definitely worth it. Thank you publishers and author for a copy of the book in exchange for an honest review. Very glad you put Wickwythe Hall on tour and that I got to review it. Now, for that audio! 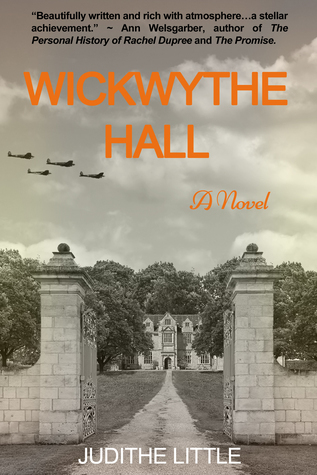 Sign into Goodreads to see if any of your friends have read Wickwythe Hall. "Reading this for a Lone Star Book Blog Tour and I COULD NOT put it down last night. Gotta love when that happens!!! Review is coming next week! #LSBBT"